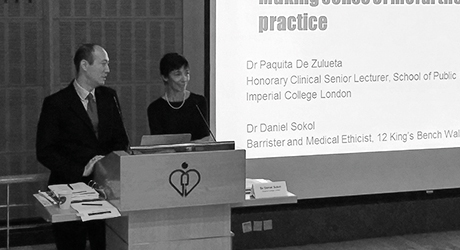 Dr Sokol has delivered major keynote speeches on medical ethics and law to large audiences (>3,000 delegates) around the world. He has been ‘guest international speaker’ at leading international surgical conferences, and provided ethics training to healthcare companies and health authorities, including the Hong Kong Hospital Authority. He gives regular talks at conferences, seminars, grand rounds, and other events, both nationally and internationally. His speaking areas include medical ethics and law, with particular expertise on clinical ethics and clinical negligence. A member of the prestigious Magic Circle, Dr Sokol often incorporates one or two magical effects into his presentations to explain a point or principle. All his lectures contain real-world examples and are designed to assist clinicians in their day-to-day practice. The presentations are typically 45 min – 1 hour long but can be tailored to your audience and any other requirements. Truth-telling in medicine; is honesty always the best policy? Each lecture involves real-life examples, and some even include a magic trick or two to illustrate a point or principle. Want to book Dr Sokol for your next event?